Are you looking for a fun way to stay hydrated? 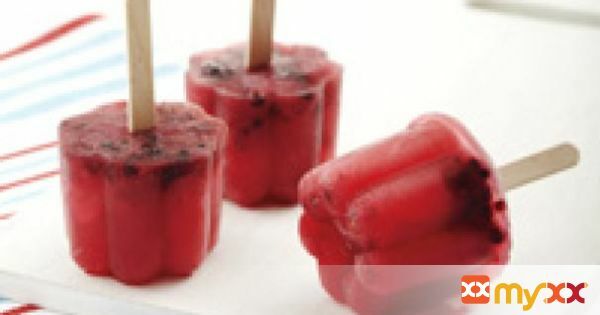 To add some variety and fun to your freezer this fall, Minute Maid has partnered with the Canadian Living Test Kitchen to whip up this frozen pop. It's an easy recipe, one of many that can be found on minutemaid.ca, and it is just as much fun to make as it is to eat. 1. Place blackberries in large bowl and smash with wooden spoon. 2. Add frozen lemonade concentrate, water and mixed berry blend. 3. Pour into popsicle molds leaving ½-cm room at top for expansion. 5. Per serving (approx. 1/4 cup / 2 oz. per one pop): about 47 cal, 0 g pro, 0 g total fat (0 g sat. fat), 13 g carb (1 g dietary fibre, 11 g sugar), 0 mg chol, 4 mg sodium, 11 mg potassium. % RDI: 8% vit C, 1% folate.